Students and organizations were recognized for their leadership at the 31st annual Rainville Awards. |Photo by Grace DeSanti. 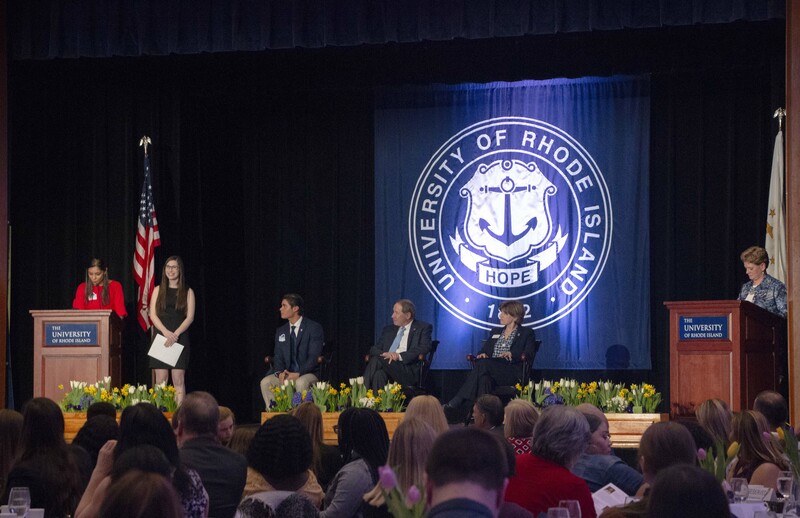 The 31st annual A. Robert Rainville Leadership Awards were held Tuesday night, honoring students N’Deye Yacino Dabo, Dakota Grenier, Natalie Timas and the group URI D.R.I.V.E. for their excellence in student leadership. The ceremony gives out four prestigious awards each year: employee excellence, team excellence, servant leadership and student leadership. This year, 173 nominations were submitted for these awards. The 2019 Employee Excellence award was presented to N’Deye Yacino Dabo, a PharmD and French major graduating in 2021. Dabo was chosen over five other finalists to receive this award. The employee excellence award is presented to a student that illustrates an exceptional commitment to their student employment at URI. Dabo became a residential advisor (RA) in 2015. According to a nominator, Dabo worked 1,274 days of continuous employment for URI, after she was initially hired as an RA. Dabo is also a member of many other on-campus organizations such as a founding member of Alpha Zeta Omega, treasurer for M.U.S.I.C. and a member of CVSA, SAWA, DIVE RI among others. The award for team excellence was presented to URI D.R.I.V.E., which stands for diversifying, recruiting, inspiring, volunteering, educating. D.R.I.V.E. works to diversif URI’s campus by creating opportunities for underrepresented students to experience URI firsthand. This includes events such as the Multicultural Overnight Program,which hosts high school students overnight on campus to get a sense of the University. The award recognizes a team that has clear goals and values making a collective effort on campus. “With their main goal being promoting diversity, D.R.I.V.E. strives to create a more supportive, welcoming environment for multicultural students of URI,” Presenter Emily Fischer said. The award for servant leadership is presented to a student who selflessly puts others before themselves, according to presenter Troy Durand. Junior Dakota Grenier, a nursing major at URI was the recipient of this award. Grenier has been committed to service on and off campus such as the Lymphoma Society, the Tomorrow Fund, the American Cancer Society, URI’s Rotaract and more throughout her time at URI. The final award, the student leadership award, was presented to senior nursing major Natalie Timas. Timas has been involved in URI as a member and Vice President of P.I.N.K. Women, a resident advisor, a nursing ambassador, an orientation leader and more. The award is presented to a student that has exemplified outstanding leadership skills, empowered others positively, and acts as a role model for other community members. Maureen McDermott, assistant director of student involvement, helped organize a majority of the event. At the ceremony, McDermott highlighted how important the Rainville Awards are to the URI community and legacy of Robert Rainville. “This program allows us to showcase the breadth and scope of programs and activities in which our students are so fully involved for the greater good of the URI campus,” McDermott said. The Rainville Awards are held in honor of A. Robert Rainville, a longtime member of URI’s faculty in the departments of student activities and student life, even serving as vice president for Student Affairs until his death in 1986. Rainville was a leader who prioritized the needs of others above his own, a quality student leaders look to emulate in their work at URI to this day. 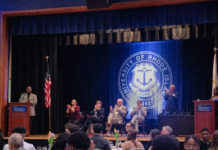 URI President David Dooley was in attendance as well, greeting audience members, as well as honoring recipients and nominees on stage during the awards ceremony. In order to be considered for an award, students, faculty and staff must nominate their peers during the first semester of each academic year by a recommendation. From there, nominees are narrowed down until a set of finalists is reached through selection committees. These finalists are honored and introduced at the ceremony.